Happy Halloween folks! How is it the end of October already- seriously? I'm popping in here today to share a peek at my home decked out for fall and Halloween and a couple of quick and easy treats I made for the kiddos this year. The dark pics are not me trying to be all moody, it's that the sun has not come out for days. We went from warm summery weather to chilly, cloudy late fall weather in the span of a week. I got the idea for this little guy from the October issue of Country Living magazine- it's a dollar store pumpkin- I painted the white for his face, added a brass butterfly (you remember those? Why i have them is a mystery to me) for his nose, some old wire for the whiskers and hot glued on some felt ears. He is even cuter than I had anticipated- totally worth the couple bucks and 20 minutes to make him! So now you've seen the place, time to eat, right? Here's two easy peasy treats I made for my kids this year- and I'm serious, they're EASY. I made a regular recipe of crispy treats and put them in a rimmed baking sheet- so they aren't so thick- then cut them into rectangles after they cooled and set up. Melt some chocolate melts- I had white and tinted it green, but you can buy green ones too- and dip the bottom 1/2 to 2/3 in the chocolate. While the chocolate is still warm, push a chocolate chip into each side to act as Frank's bolts. For his face, I just used some black gel icing and (poorly) drew on a face and some stitches. 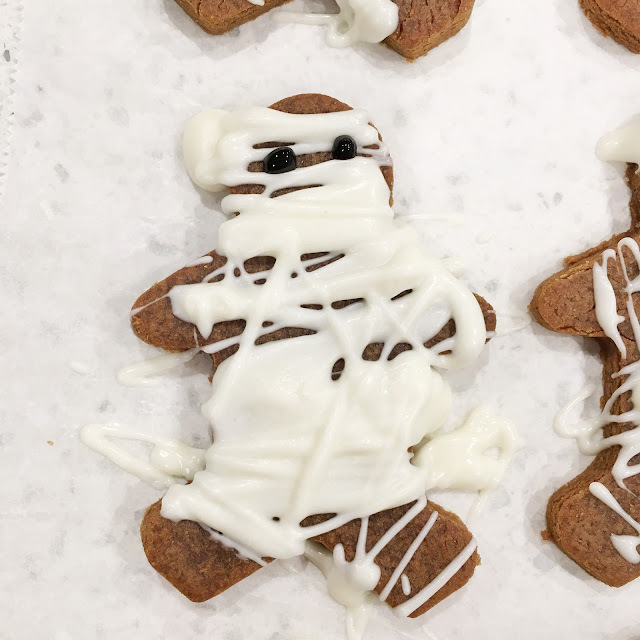 Either bake up a basic gingerbread recipe or get premade gingerbread men. Melt white chocolate or white chocolate melts and drizzle across the body- trying to leave an opening for the eyes to peek out and changing the direction on the arms and leg. Dot black gel in the open spaces for eyes.